We’ve all heard (and most have probably experienced) the classic saying, “Kids are like sponges”. Personally, I think the saying should be, “Newbies are like sponges”. I believe and have seen proof that as humans entertain a new discipline, they absorb and replicate behaviors that they are shown or think to be beneficial/correct. One of the most common problems I see as a result of the Newbie-Sponge hypothesis is what I call “Spear Fishing,” where instead of fully extending their arm(s) parallel to the surface of the water, they drive their arms down towards the bottom of the pool, generally on a 45-90 degree angle with respect to the surface of the water. Thus, at full extension they are pointing at the bottom of the pool instead of directing their hand movement towards the end of the pool they are swimming towards (it’s what the swimmer is doing wrong in our A Session at Tweak video) This mistake is easy to correct, simply ask the swimmer to raise their hand as if they are asking a question in school, explain to them that this is the proper way to extend your arm after entry and then have them perform that same act in the pool repeatedly. 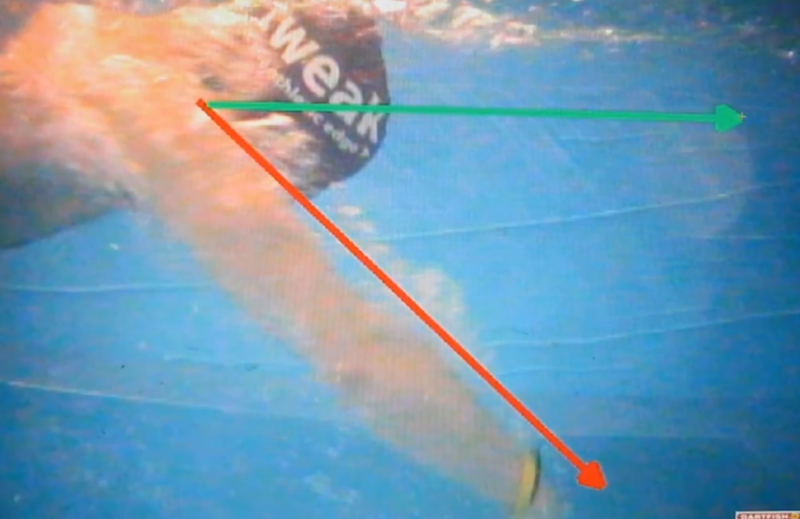 Having a mirror directly beneath the swimmer providing immediate visual feedback greatly assists with this correction. This easily correctable behavior is quite common, which made me wonder why it occurs so frequently in the first place. I began to ask swimmers why they “Spear Fish”? Most “newbies” didn’t have an answer to the question, I continued by asking them if their coach ever told them to “reach”? As I asked this question, I would raise my arm to shoulder height and fully extend it(if I were laying on the ground it would look as thoughI’m pointing straight up at the ceiling). This question prompted enthusiastic head nodding by the newbies and confirmed my suspicion—the problem was revealed. It is not the fault of the newbies who are doing EXACTLY what their coach has said/shown but it is the mistake of the coach who demonstrates reaching/extending without properly orienting themselves in space around them that causes the problem. Always remember we are only able to swim, we are not meant to swim. While swimming, your world is rotated 90 degrees towards the ground (actions are also inverted but more on that later) and this is lost onto the newbs who are still thinking in upright terms. So when a coach says “reach more” what they are saying in upright speak is ask a question longer and try to get your hand to touch the ceiling. Since getting to the bottom of this communication issue, I have made it a point in coaching to always orient myself properly before explaining and demonstrating some aspect of stroke, especially to the newbs. If I’m not laid out on one leg, basically in airplane pose, so that my orientation is as the swimmers will be in the water, then I’m pointing my hands straight up into the sky, telling them that they are viewing me from the bottom of the pool and the ceiling is the end of the pool I’m swimming towards. While it’s very rewarding to see the benefits the swimmer receives as we correct “Spear Fishing” in the tank at tweak < the athletic edge > and on the pool deck, the entire problem can be prevented if the proper orientation is demonstrated and explained while teaching swimmers, especially the newbs, certain aspects of stroke mechanics. Great article to read for anyone looking to improve their swimming stoke. Hi Ho, Hi Ho! It’s Off to Trials They Go!